The rich, flavorful broth in which the chicken braises ensures a tender and succulent dish. An added bonus is the delicious aroma wafting through the kitchen while braising. Pat thighs dry with paper towels and season both sides of each with 1 teaspoon salt and ½ teaspoon pepper. Heat oil in 12-inch skillet over high heat until just smoking. Add thighs and brown on both sides, 10 to 12 minutes. Transfer thighs to large plate and pour off all but 2 teaspoons fat from skillet. Return skillet to medium heat, add onion and ¼ teaspoon salt, and cook, stirring frequently, until just softened, about 3 minutes. Add 2 teaspoons garlic, bay leaf, and cinnamon and cook until fragrant, about 1 minute. Add sherry and cook, scraping up any browned bits, until sherry starts to thicken, about 2 minutes. Stir in broth and tomatoes and bring to simmer. Return thighs to skillet, cover, transfer to oven, and cook until chicken registers 195 degrees, 45 to 50 minutes. Transfer thighs to serving platter, remove and discard skin, and cover loosely with aluminum foil to keep warm. While thighs cook, finely chop egg whites. Discard bay leaf. Transfer ¾ cup chicken cooking liquid, egg yolks, almonds, saffron, and remaining garlic to blender jar. Process until smooth, about 2 minutes, scraping down jar as needed. Return almond mixture to skillet. Add 1 tablespoon parsley and lemon juice; bring to simmer over medium heat. Simmer, whisking frequently, until thickened, 3 to 5 minutes. Season with salt and pepper to taste. 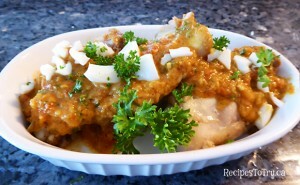 Pour sauce over chicken, sprinkle with remaining 1 tablespoon parsley and egg whites, and serve. Chicken thighs are fully cooked when they reach 175 degrees, but they are purposely overcooked very slowly to allow the collagen in the meat to break down into gelatin, making the meat more tender and juicy. Unlike stews, sauces, and stir-fries that are thickened with starches or dairy, many Spanish stews and braises get their rich, hearty body from a pesto-like nut-based thickener called apicada. The basic formula, which many sources claim dates back to at least the 13th or 14th century, includes finely ground almonds or hazelnuts (picar means “to chop”) and seasonings like garlic, herbs, and spices. But many versions also contain toasted or fried bread or even hard-cooked egg yolks, as in the recipe here. The ingredients are traditionally pounded to a thick paste with a mortar and pestle (a blender for speed is faster) and stirred into the pot toward the end of cooking so that it can lend body, richness, and flavor to the cooking liquid. Almonds processed with garlic, saffron, and hard-cooked egg yolks add body and flavor to the braise. Unlike white meat, which dries out and toughens when overcooked, dark meat actually benefits from being cooked well beyond its doneness temperature (175 degrees). That’s because dark meat contains twice as much collagen as white meat, and the longer the meat cooks, the more that collagen breaks down into gelatin, which coats the meat’s protein fibers and makes it moister and tender. (Dark meat also contains roughly twice as much fat, which coats the meat’s proteins, and has a higher pH, which helps it retain moisture more effectively.) But it’s also important to cook thighs low and slow so that they spend as much time as possible between 140 and 195 degrees—the temperature range in which collagen breaks down. Sherry, a wine fortified with brandy, can be confusing to buy because it comes in a wide range of styles such as dry, sweet, cream, and “cooking.” But for savory cooking purposes, stick with the dry kind. Sweet and cream Sherries will taste overwhelmingly sweet when reduced in sauces, and cooking sherry, which has been treated with salt and preservatives to make it shelf-stable, can render a dish too salty. You need to give credit to America’s Test Kitchen for this recipe. Also, while recipes can’t be copyrighted, the notes are. And even if you don’t get caught plagiarizing, you should feel at list a little bad, morally, because ATK spent hours figuring out this recipe and compiling the notes specifically for its members. I did give credit by quoting the source which was The Cooks Illustrated Magazine which is a part of America’s Test Kitchen. I thought you just gave photo credit to Cooks Illustrated, not recipe credit, but maybe I misunderstood that. But you still shouldn’t share the notes – again, Cooks/ATK did all that research specifically for people subscribed to their magazine or to their website recipes. It’s kind of like posting the text of someone’s book online. Not cool, and not legal. Someone can watch the show and copy down the recipe for free. No subscription required. The only problem with this post is, that if you watch PBS, which I do. ATK/Cooks gives these recipes on air, and you can easily look up the recipe on the PBS website, which I have done. In my ever humble opinion if ATK/Cooks didn’t want these recipes out there, they wouldn’t be on PBS.